There was never a better time to make cold brew coffee than NOW. Sure, it’s the end of August and maybe you’re dreaming of chillier fall days, but as of right now, it’s still summer and it’s meant to be enjoyed. This recipe is pulled straight from The Culinary Cyclist, and it’s one that I swear by in the warm weather months, and even in some colder ones. 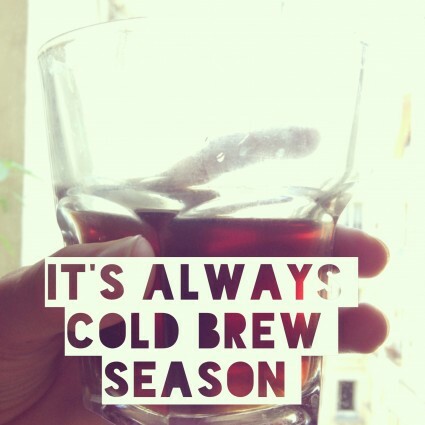 Because let’s be honest, you could always drink a cold brew. Ratios of coffee to water vary, and you can tweak according to how strong you want it. For a 32-ounce French press (4 cups) I use about 3/4 cup of coffee beans, which is a little less than a 1 to 4 ratio. Place grinds into empty French press and fill with cold water. Gently stir with a spoon to mix. Cover the French press with tinfoil and let steep for at least 12 hours at room temperature. It’s even better when you let it sit for 24 hours, but that takes some planning. Remove the tinfoil and press the grinds down. Serve over ice. If it’s a little strong, dilute with water. Go nuts and add a little ground cardamom or cinnamon if you’re feeling feisty. Store in refrigerator in glass bottles or a covered pitcher.